Já jsem si nainstaloval Windows 2000 anglickou verzi. Prosím a tento fuul pack https://mega.nz/#F!2lBVBBLI!WqmqhpxuX0qyCY1LiX4-gw!WsJDhZIY mám převést na ISO a vypálit a pak z něho nabootovat? A tam v tom je obsažen i ten SP5.2? I installed the Windows 2000 English version. Please do this fuul pack https://mega.nz/#F!2lBVBBLI!WqmqhpxuX0qyCY1LiX4-gw!WsJDhZIY convert to ISO and burn and then boot from it? And there is also included SP5.2? Please do this fuul pack https://mega.nz/#F!2lBVBBLI!WqmqhpxuX0qyCY1LiX4-gw!WsJDhZI﻿﻿Y﻿ convert to ISO and burn and then boot from it? Download HFSLIP2000-FullPack-2000-ENU.7z and unpack it. Make sure that the path is not too long, so I would suggest something like "d:\hfslip". Run HFSLIP2000-1.0.2.CMD once. Several folders will be created automatically. Copy your unmodified Windows 2000 source to the SOURCE folder. Make sure to unpack everything in case it is an ISO file. Run HFSLIP2000-1.0.2.CMD again. Make sure to use "Run as Administrator" when using newer versions of Windows. Do not use the computer while HFSLIP is processing the files. 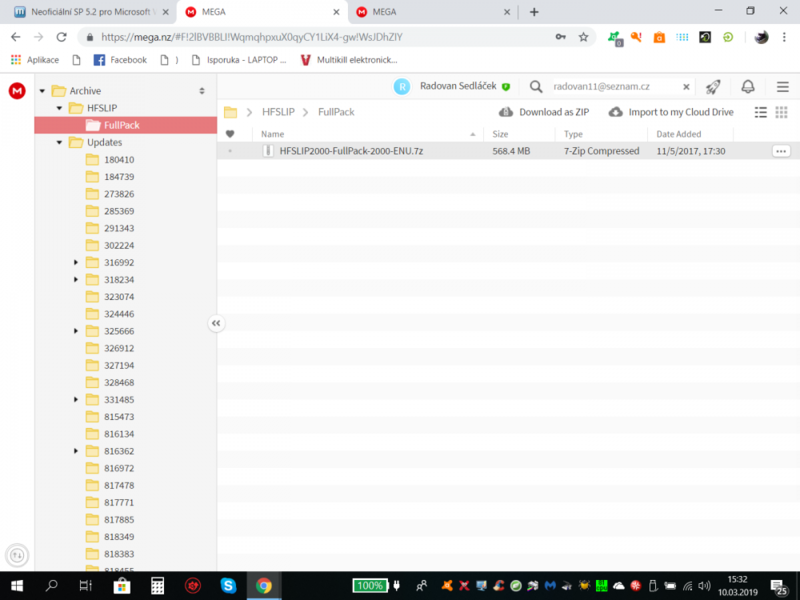 The reason is that HFSLIP will keep stealing focus when unpacking the updates, so you can actually interrupt the process by mistake when trying to type on the keyboard, etc. An ISO file of the updated Windows source will be created in the HFSLIP folder. You should test it in a virtual machine, e.g. VirtualBox to make sure that it works correctly. I'm not sure if this is the right place to ask, but did .NET 4.0 on 2000 ever end up working﻿? Prosím toto mám stáhnout to má velikost nějakých 30,49 GB? Please download this this size of some 30.49 GB? I am sorry but I do not really understand the question . The link seems to only show information of a user who is currently logged in to MEGA. Could you include a screenshot to make the question clearer? Judging by the quoted size alone, I am guessing that you may be asking about the size of my whole Archive which is indeed ~30 GB. Please keep in mind that it includes updates for both Windows 2000 and XP, and also SP3 for Windows Server 2003 which is ~7.5 GB alone. Prosím čekejte, prosím, maximálně 30,49 GB? 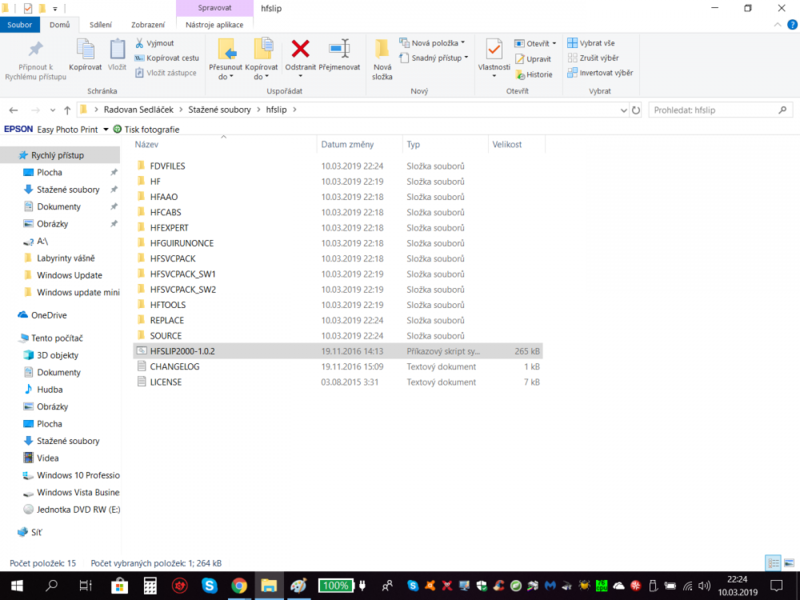 Stáhněte si tuto velikost asi 30,49 GB? Stáhněte si HFSLIP2000-FullPack-2000-ENU.7z a rozbalte jej. Ujistěte se, že cesta není příliš dlouhá, tak bych navrhnout něco jako "d: \ hfslip". Spusťte jednou HFSLIP2000-1.0.2.CMD. Několik složek bude vytvořeno automaticky. Zkopírujte nezměněný zdroj systému Windows 2000 do složky SOURCE. Ujistěte se, že jste rozbalili vše, pokud je soubor ISO. Spusť znovu HFSLIP2000-1.0.2.CMD. Ujistěte se, že používáte "Spustit jako správce" při použití novějších verzí systému Windows. Počítač nepoužívejte, zatímco HFSLIP zpracovává soubory. Důvodem je, že HFSLIP bude při rozbalování aktualizací držet krok zaostření, takže při pokusu o psaní na klávesnici můžete chybně skutečně zastavit proces. Soubor ISO aktualizovaného zdroje systému Systém Windows bude vytvořen v adresáři HFSLIP. Měli byste jej vyzkoušet ve virtuálním stroji, např. VirtualBox, abyste se ujistili, že funguje správně. Zkopírujte nezměněný zdroj systému Windows 2000 do složky SOURCE- nerozumím který nezměněný zdroj systému Windows? které složky všechny? od FDVFILES až REPLACE všechny? Nemáte prosím promiňte mě to někde obrázkový návod, jak to udělat? Copy the unchanged Windows 2000 source to SOURCE - do not understand which unchanged Windows source? which components all? from FDVFILES to REPLACE all? Do not you please excuse me somewhere in the picture how to do it? Yes, the FullPack contains all the required updates. I have not updated my website for a while, so some of the newest updates for XP POSReady are probably missing. The FullPack also does not contain any unofficial updates, just the official ones. It should still be more than enough though to serve as a basis for a fully updated Windows 2000 system. Copy the unchanged Windows 2﻿000 source to SOURCE - do not understand which unchanged Windows﻿ source? ﻿﻿ which components all? from FDVFILES to REPLACE all? Judging from the screenshot, you seem to have everything unpacked and ready to go. By "unchanged Windows source" I mean the contents of your clean Windows 2000 CD (or ISO) which have not been modified by programs such as HFSLIP, nLite, or any others. You need to copy all the files from your Windows CD to the SOURCE folder. Then just right click on the "HFSLIP-1.0.2.cmd" and run it as Administrator. Do not use the computer while the script is running. I created an integrated ISO using HFSLIP2000-FullPack with the source files from the original Win2000 Pro SP4 CD, but for some reason trying to run .NET 2.0 programs on the installed system always fails. I deleted the .NET cabs in HFAAO, re-created another ISO, and installed .NET 1.1 & 2.0 on the new system manually. Now the programs run as normal. Not sure why this happened. I will try to check it myself, but just in case could you give me names of those programs? I will try to check it myself, but just in case could you give me names of those program﻿s? The .NET programs I tried are WinMD5 v2.0 and a small program targeting .NET 2.0 from a game mod project I'm helping with.